There are overall four variants of the Bajoran subimpulse raider and its redresses. 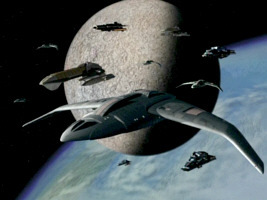 The small starship shows up in seven episodes in one form or another. 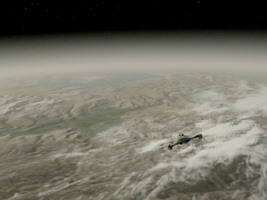 The first two times we are looking at a physical miniature, whereas a CG model appears in the following five episodes. 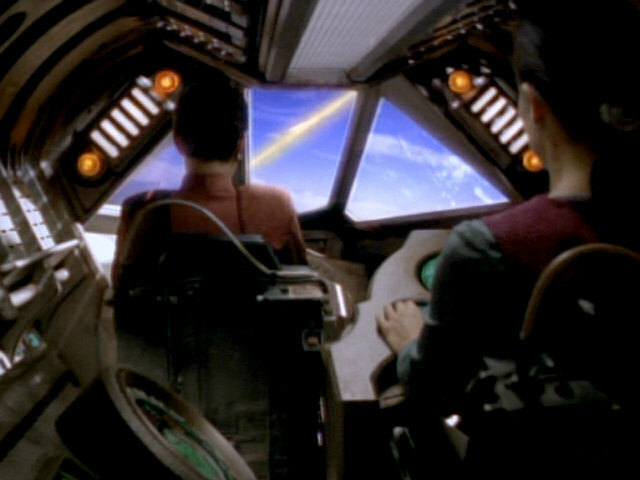 In the first two episodes we can also see the cockpit. 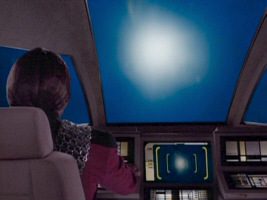 After that the model is visible only briefly or in the background. The miniature was originally built for this episode. 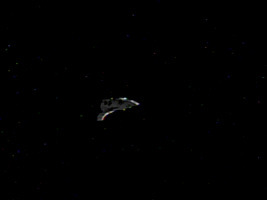 We can see it a couple of times, mostly in space or in Bajor's atmosphere. 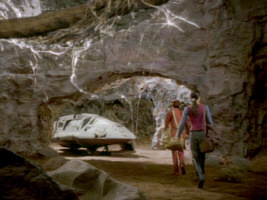 In the very first scene, however, it appears on the surface of Lunar V, a Bajoran moon. 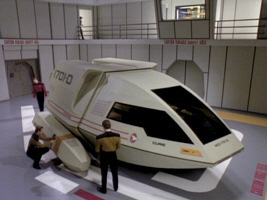 Here, a shot of the model was inserted into the set in post production, as a full-scale model was never built. 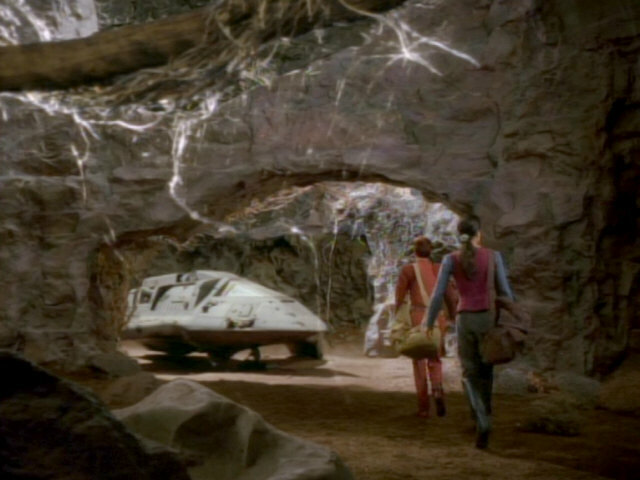 The rock arch most likely covers the imperfections around the inserted shot with Kira and Dax in the foreground. 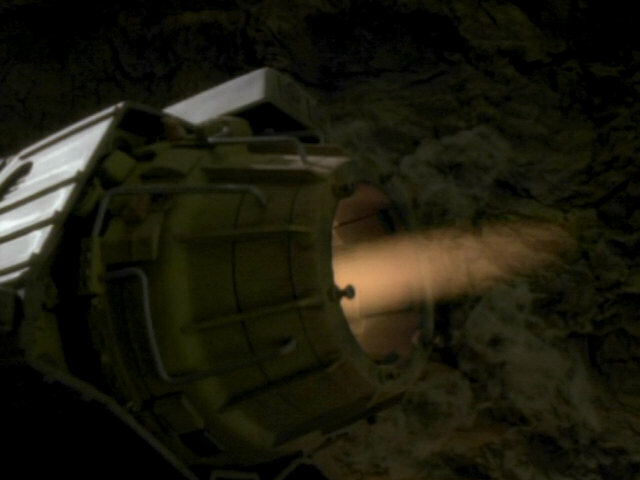 Bajoran raider in DS9: "The Siege"
The next we can see is a shot that shows the engine nozzle of the raider. Here, as well as in most later scenes, the engine color is yellow. 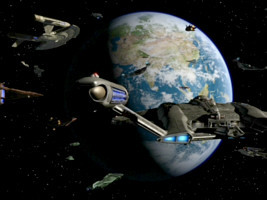 Only the color on the Xantoran ship in ENT: "The Breach" is blue. 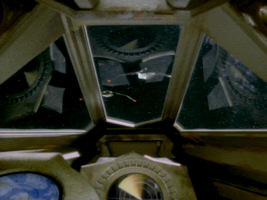 In "The Siege" we can also see the narrow cockpit with its characteristic windows. As the cockpit is so narrow, Kira and Dax have to sit in a row instead of side by side the way it would be possible in all usual shuttles. 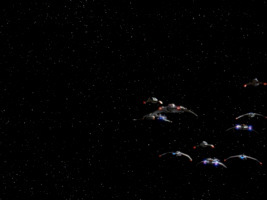 After the filming of "The Siege" the cockpit set was most likely scrapped. 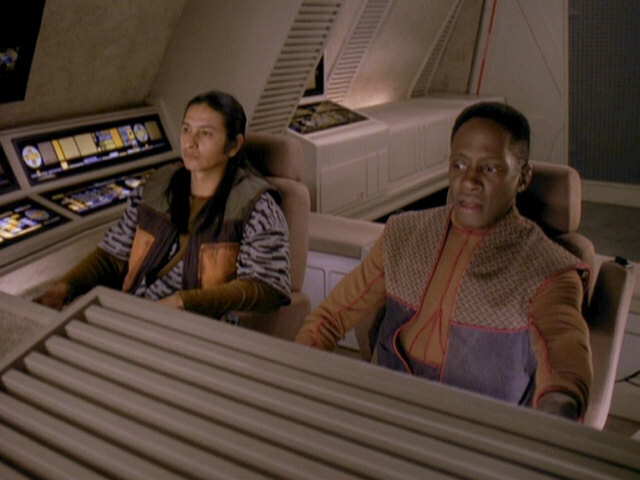 Single consoles in front of and beside Dax occasionally reappear in later episodes. Bajoran raider cockpit in DS9: "The Siege"
The model shows up a few months later, this time operated by the Maquis. 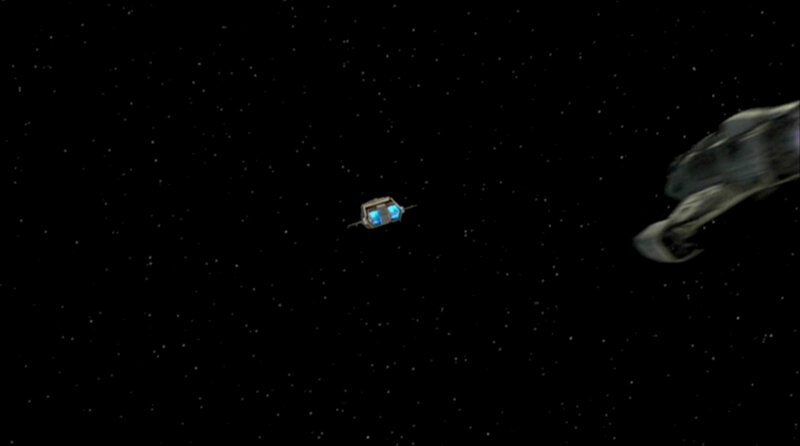 It passes by the camera very quickly, but at least we can make out some more details on the HD screen caps. 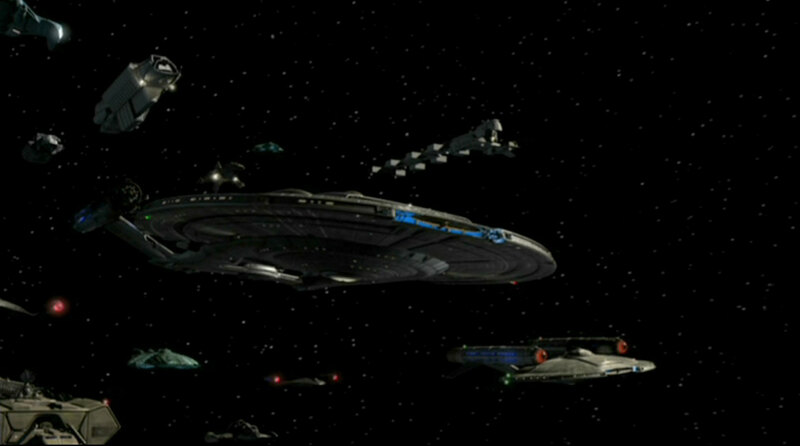 It looks like the model was not used for the first shot of the episode that shows Maquis vessels. 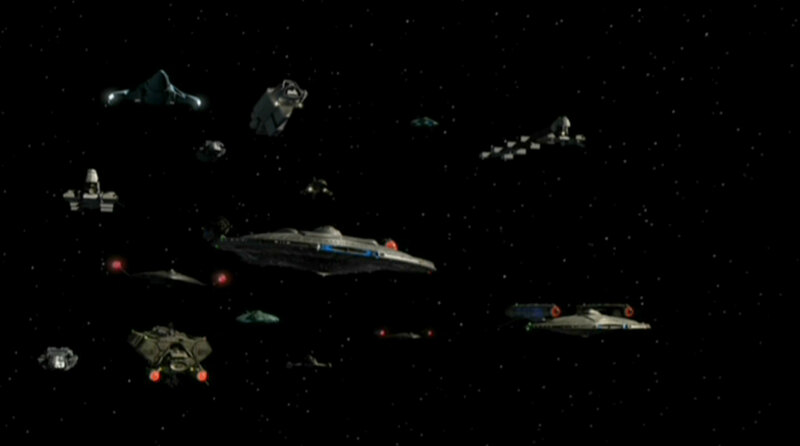 Here, numerous small ships attack a big Cardassian Galor class. 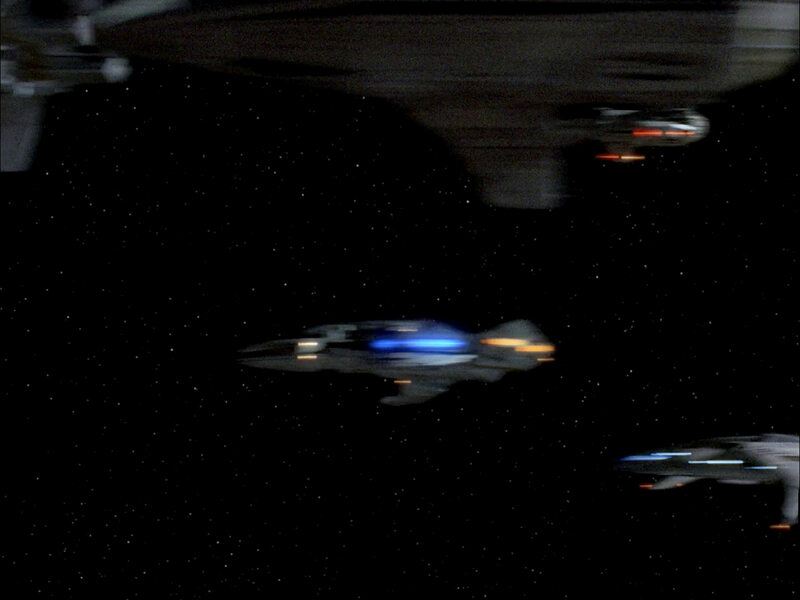 Even in HD, we can only see the more streamlined Bajoran attack ship, the Maquis Raider (with the small cockpit) and the Federation fighter in this scene but not a single Bajoran raider. 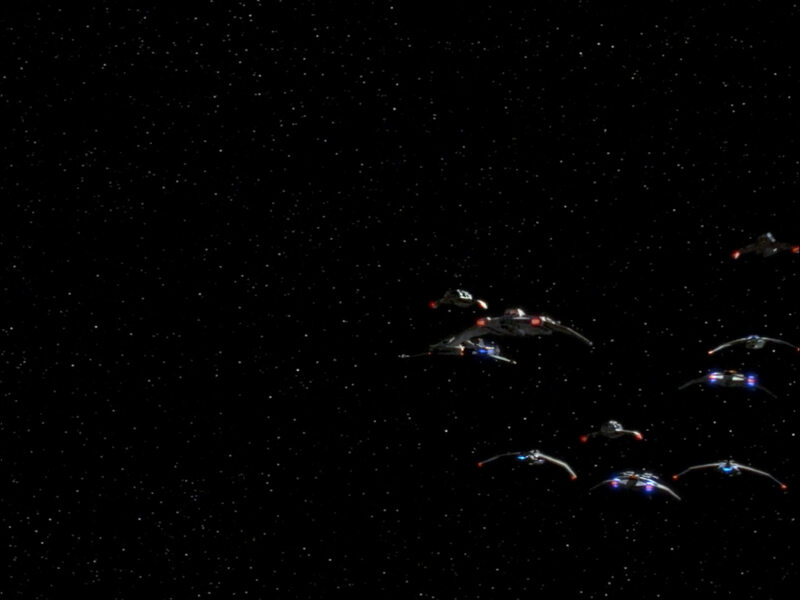 Later in the episode, we can clearly make out three Bajoran/Maquis raiders. 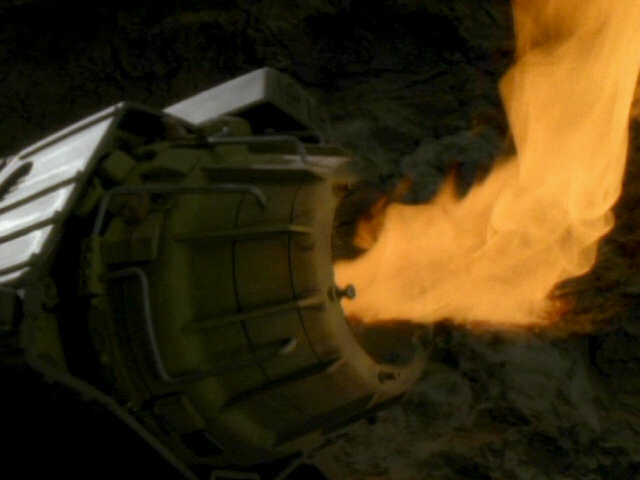 Once again the engine color is yellow/orange. 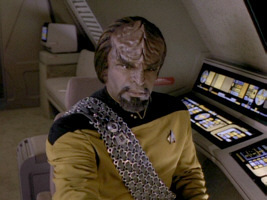 Maquis raider in TNG: "Preemptive Strike"
As the original cockpit set did not exist any longer, a new one was required. 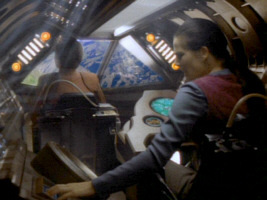 It is obvious that for two brief scenes it was not worth the effort to build a new cockpit from scratch. 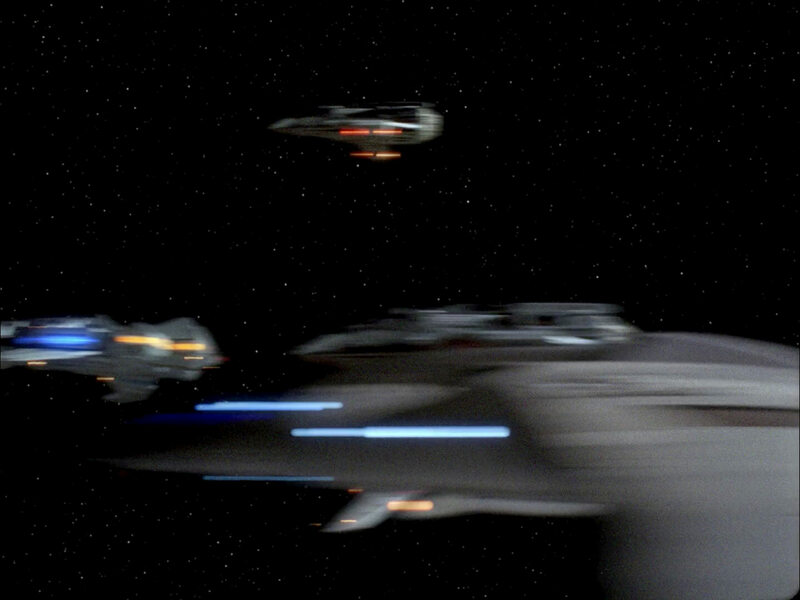 This is why a quickly available Type-6 shuttle cockpit was used. As the Maquis are explicitly said to use Federation ships, it was not deemed necessary to incorporate Bajoran consoles as they appeared in "The Siege". 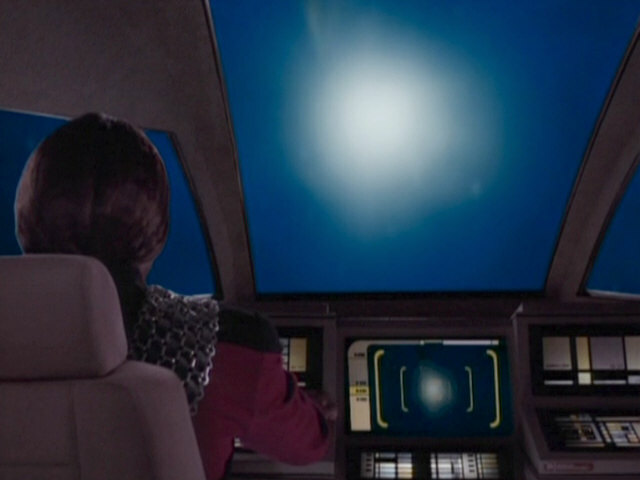 Yet, there was the problem that the windows of the shuttle model no longer matched those of the interior (now taken from the Type-6 shuttle). 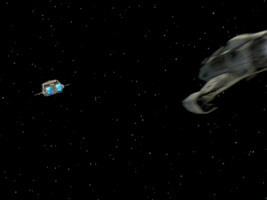 The discrepancy was fixed with a modification of the miniature. 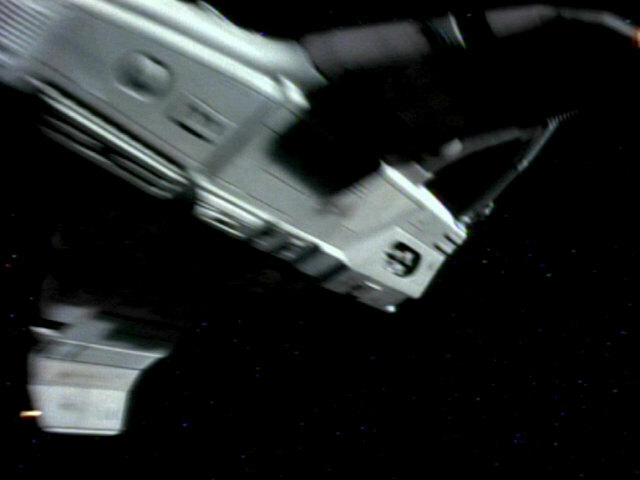 A cockpit superstructure was added, with windows that match the ones of the Type-6 shuttle. In the finished episode, however, we see only a small portion of a cockpit window, so the modification wouldn't really have been necessary. 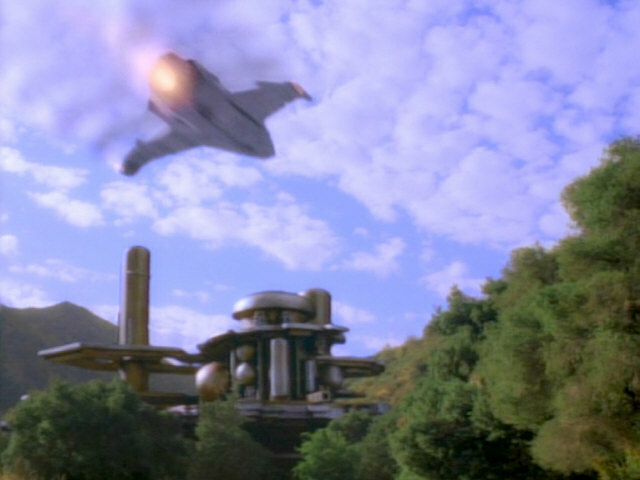 The exterior was proactively adapted though. Maquis raider cockpit in TNG: "Preemptive Strike"
Type-6 shuttle exterior in TNG: "Parallels"
Type-6 shuttle cockpit in TNG: "Parallels"
The physical model was never filmed again after this episode. 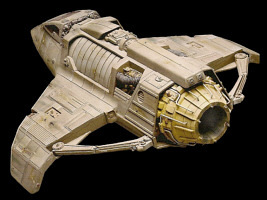 It retained the look with the new cockpit superstructure for many years and still looked like this when it was on auction at Christie's. 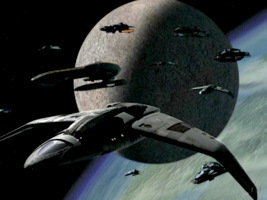 The modified miniature with the new cockpit window was the prototype for a CG model of the Bajoran raider. 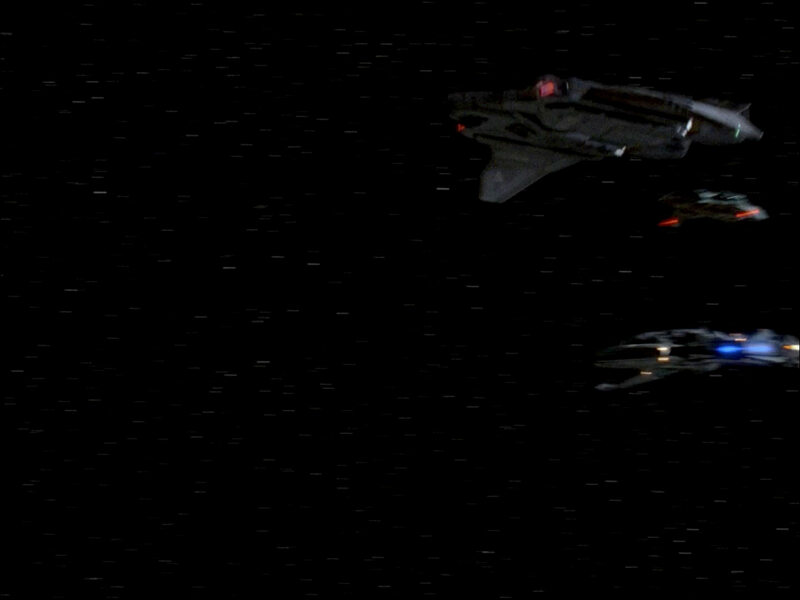 This CG model first shows up in DS9: "Shadows and Symbols", here as a Bajoran ship again. 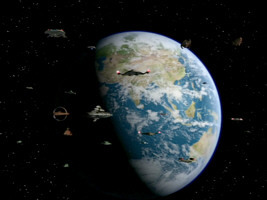 The ship appears on the left edge of the screen. 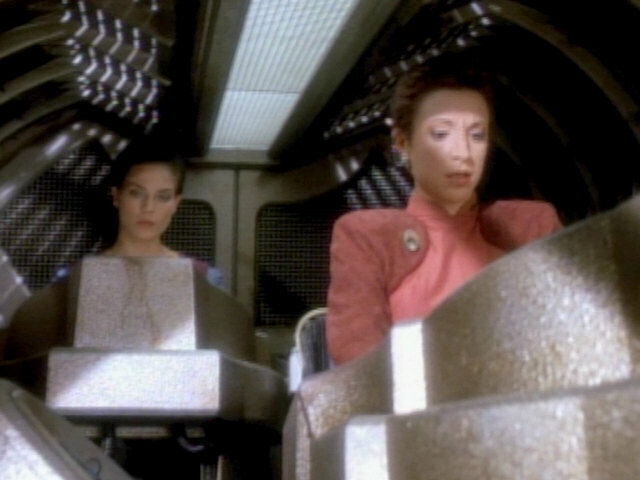 Bajoran raider in DS9: "Shadows and Symbols"
We can't ascertain that it really is the new, Type-6 based cockpit in this episode. 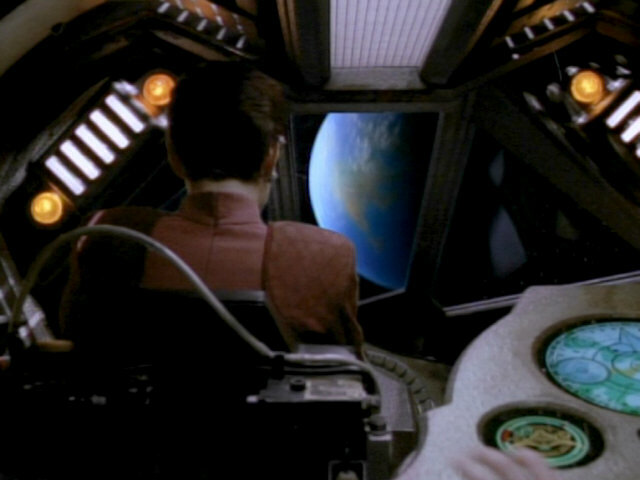 Yet, we know from the Xantoran ship that would appear several years later that the model has this cockpit. 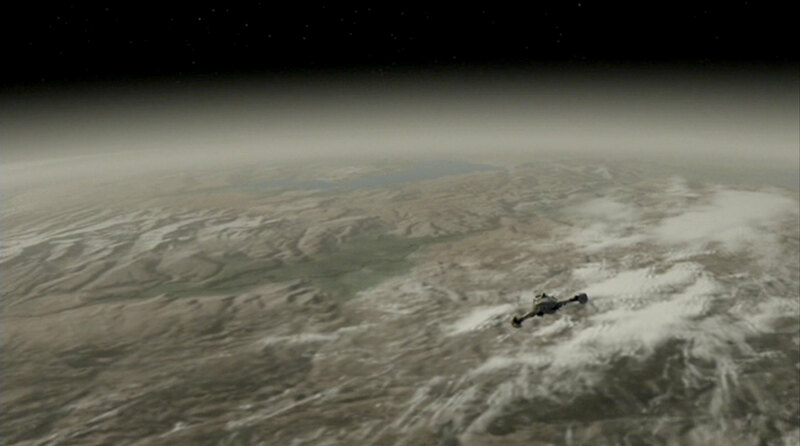 We assume that the original CG model in "Shadows and Symbols" already looked like that. 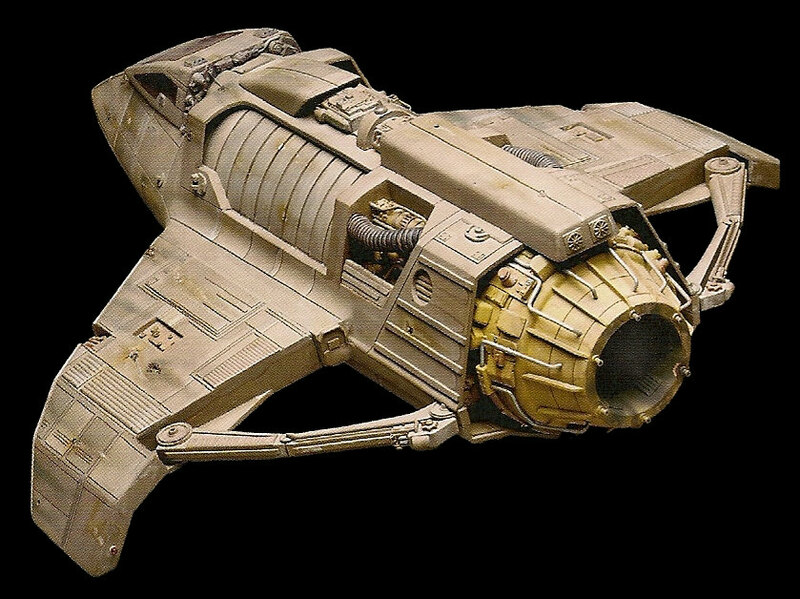 Most likely a CG version of the raider with the original cockpit from "The Siege" was never created, and perhaps it was never evident to the CG artist that the previous cockpit even existed (depending on the amount of reference material that was available, most likely in the form of pictures, rather than the model itself). 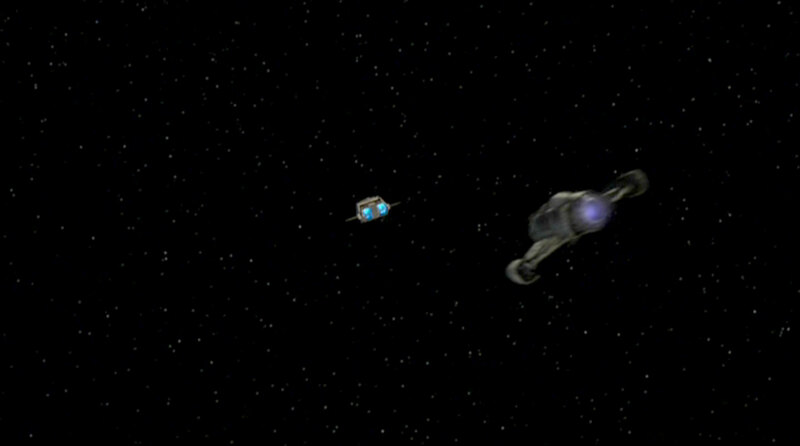 One of the numerous and mostly unfitting ships of the Antarian Transstellar Rally is a Bajoran raider. 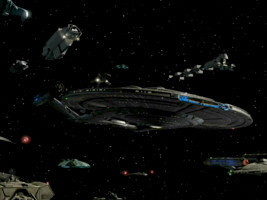 We can't see much of the ship in the episode, but it is still the same CG model as in "Shadows and Symbols", without the modifications that would be done for the Xantoran ship from "The Breach". 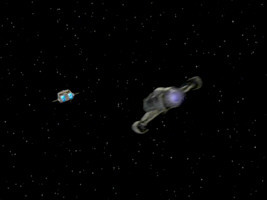 Bajoran type in the Transstellar Rally in VOY: "Drive"
A small and agile ship was needed for this episode, and the Bajoran raider CG model was used, with some modifications. 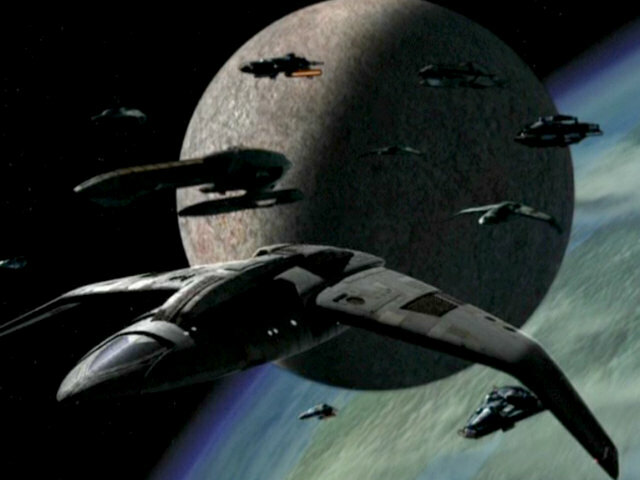 The basic structure remains the same, only the swept down wing tips were removed and two bulky superstructures added on either side of the hull. 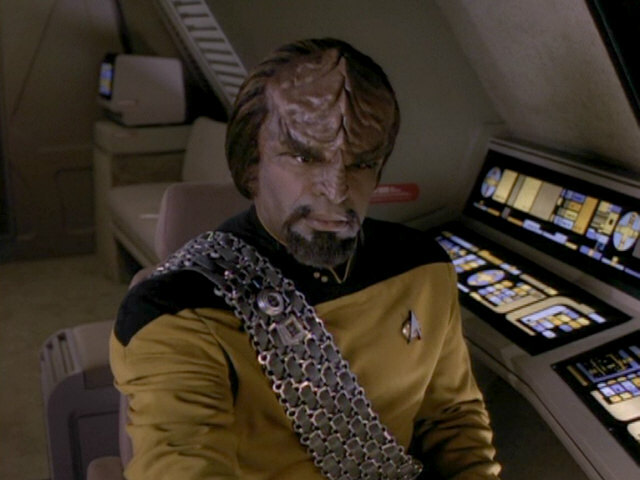 It is not evident what the latter are useful for. This ship too is propelled by a single nozzle, which shines blue instead of yellow on this version of the model. 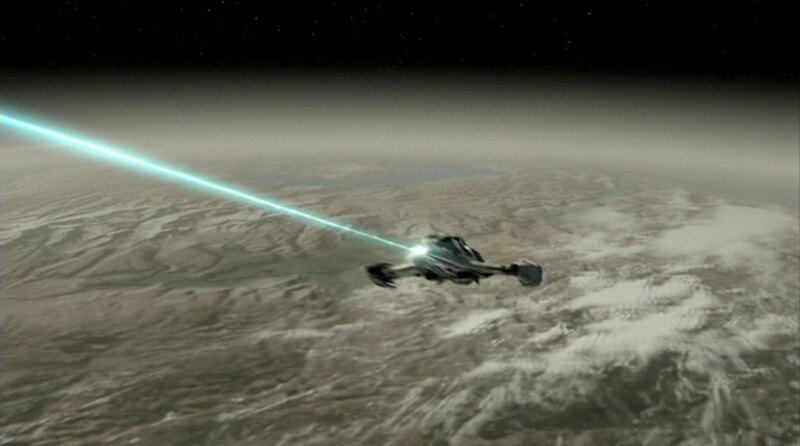 The ship is armed with a particle emitter firing turquoise beams from the front tip of the ship. 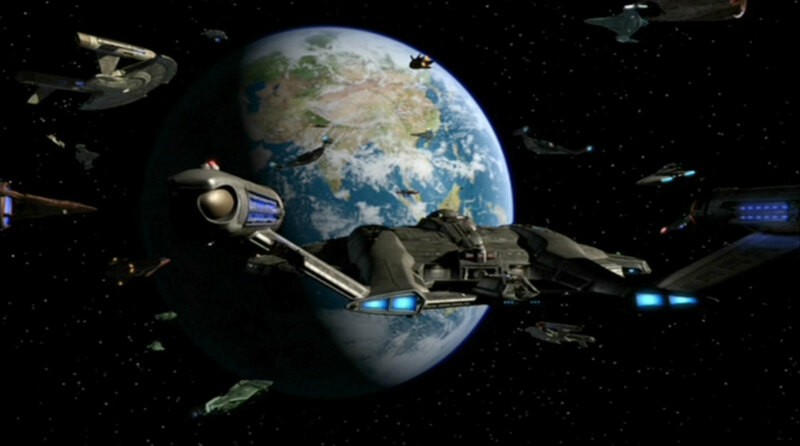 Xantoran patrol ship in ENT: "The Breach"
Complete orthographic views are available of this CG model, confirming that it is based on the Bajoran raider. The CG model of the Xantoran ship was reused for "Twilight", probably without any modifications. 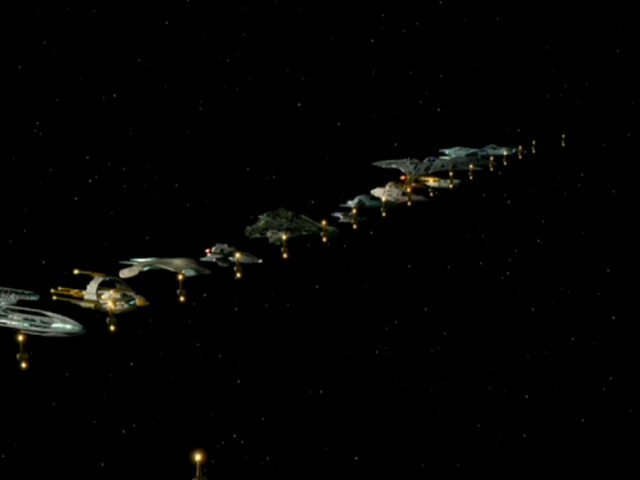 It appears in the scene with the fleet of human survivors of the Xindi attack on Earth in a parallel timeline. 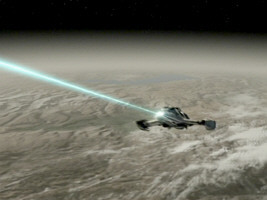 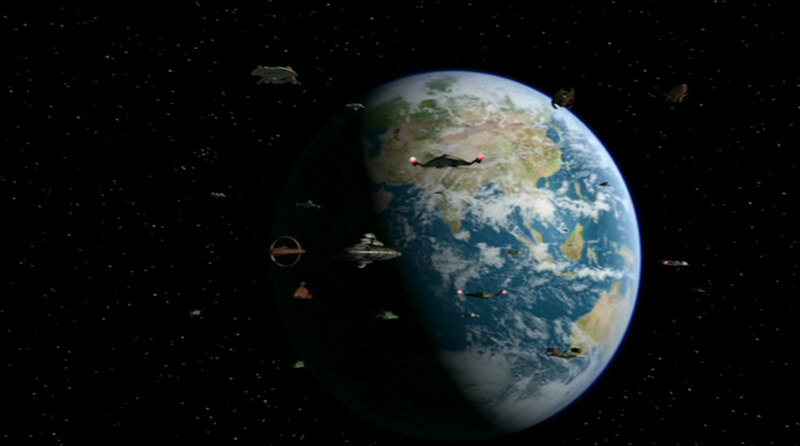 The ships are visible twice in this episode, once approaching and once flying away from the camera. 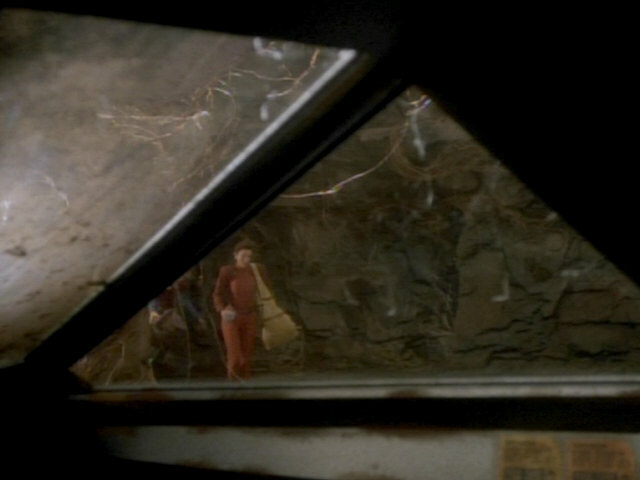 The Bajoran/Xantoran design is visible only in the first scene, on the lower edge of the screen. Earth ship in ENT: "Twilight"
The unchanged CG model of the Xantoran ship appears one more time, in the welcome fleet of ENT: "Storm Front II". A ship of this type approaches Enterprise and can be seen in the center of the screen. 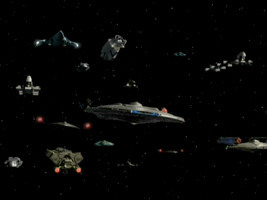 In the following, all ships turn around and return to Earth. 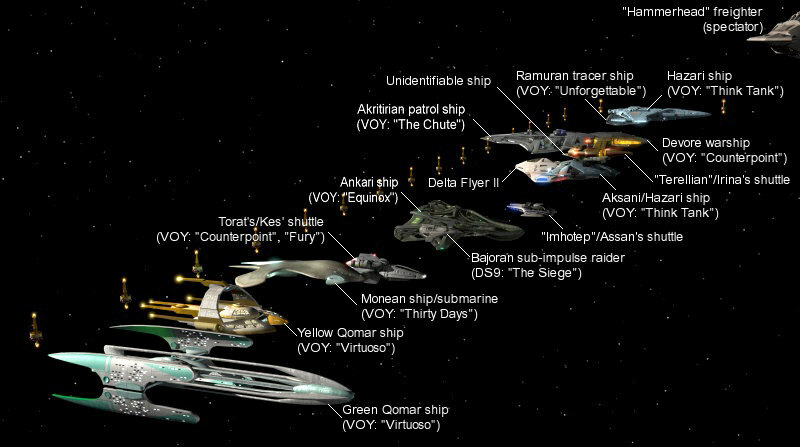 Here, we can see the ship on the left side of the screen from below (below the Intrepid). 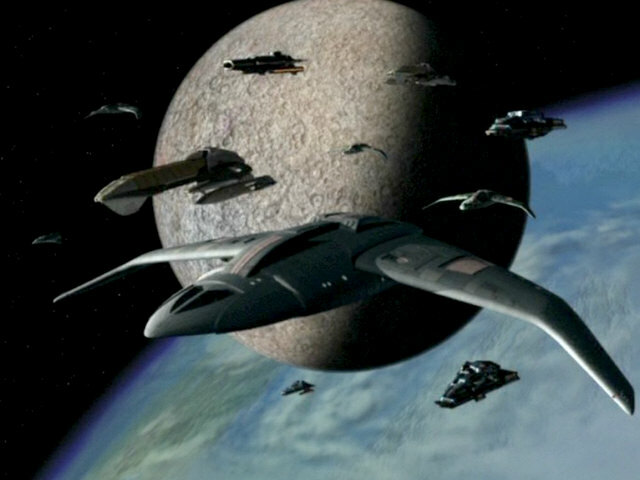 This is the final appearance of any variant of the Bajoran raider. 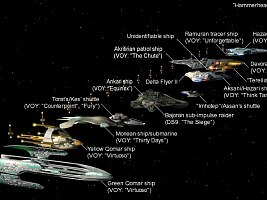 Earth ship in ENT: "Storm Front II"
Here is a summary of all appearances of the Bajoran raider and its variations.